After three wins over Hamilton, United failed to make it four in a row and indeed had to come from behind to earn a point against a side whose performance belief their bottom of the table position. The Boxing Day fixture was one of only two games to beat the Arctic conditions gripping Scotland and although the ground was generally soft, there were one or two white patches to indicate how sub-zero conditions were. 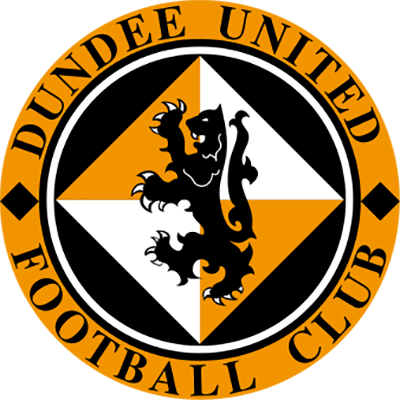 The United line-up was the same as the one which finished the match at Cappielow, because Jamie McQuilken hadn't quite recovered from the injury which saw him limp out of that match at half-time. Accies with four suspended and three injured took the game to United in the early stages with McEntegart testing Ally Maxwell after three minutes. Five minutes later Craig Brewster laid the ball off to Gary McSwegan whose first time shot had sufficient power to have Ferguson scrambling at his righthand post to save at the second attempt. The pressure on the visitor's goal mounted, Ferguson blocked a Rab Shannon shot after he collected a one-two from Robbie Winters and from the resultant corner. Renicks cleared a Brian Welsh header off the line in the 15th minute. Midway through the half McStay a clipped a pass from Lorimer narrowly past as hlamilton broke to the other end. Accies almost took a shock lead when McStay's free kick struck the top of the bar before bouncing to safety. Five minutes from the end of a far from convincing first half performance by United, they should have gone ahead. Grant Johnson carved open the visitors tightly packed defence only for Ferguson to block his shot. Brian Welsh then hit the post with a header and Ferguson palmed away Andy McLaren's shot at the near post as United at last showed the required urgency in front of goal. But that was Ferguson's last slice of the action as a calf injury forced him to quit at the break and he was replaced by Cormack for the second half. There were no changes in the United line-up, but several positional ones Andy McLaren switching to the right with Robbie Winters moving into the middle - Craig Brewster switching to wide left in midfield. United certainly looked much more lively at the start of the second period and Accies survived an appeal for handball in the box in the 58th minute. 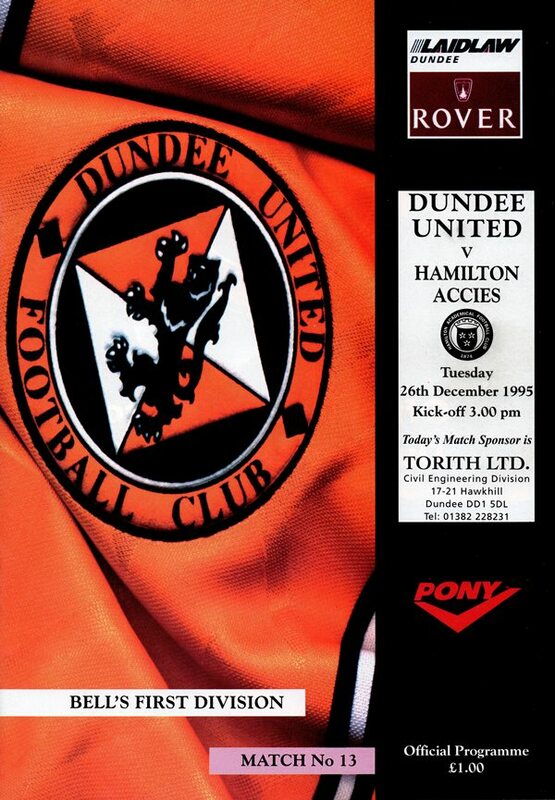 Andy McLaren was replaced by Owen Coyle, but in the 66th minute Accies shocked United when Steve Renicks cracked a 25 yard drive into the top right-hand corner. That lead lasted just two minutes, Jim Bett played a free-kick to the edge of the box. Brian Welsh headed it on and Craig Brewster slid the ball under the substitute keeper from ten yards. Eighteen minutes from the end Owen Coyle was inches away from making contact with a Gary McSwegan pass with the goal at his mercy, but hard as they tried. United couldn't find a way past the packed Accies defence Renicks - surely Accies man of the match - making his second goalline clearance when he nodded a Brian Welsh header off the line seven minutes from time. 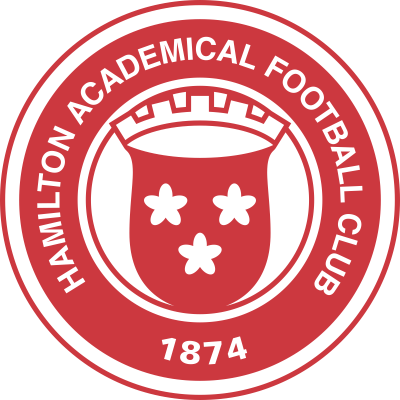 The only danger to Accies not coming away with a point in the few remaining minutes was posed by several long range efforts, but none which troubled Cormack. Club Comment - "It was ironic that we scored within two minutes of them going ahead, because we had huffed and puffed in front of goal all afternoon." BILLY KIRKWOOD, MANAGER.